The satellite-based Seahorse Mediterranean Network is to commence operations in the course of this year. This information was disclosed by the European Commission in response to a parliamentary interpellation. The Libyan coastguard, which falls within the remit of the navy, would thus be party to information from European surveillance systems. The objective is for Libya to take part in rescue missions outside the country’s territorial waters. EU member states that border the Mediterranean (Spain, Portugal, France, Italy, Malta, Greece and Cyprus) are part of the Seahorse Mediterranean Network. The countries’ national coordination centres are linked up with the Mediterranean Border Cooperation Centre (MEBOCC), which is to be based at the Italian National Coordination Centre for border control. There are also plans to involve Tunisia, Algeria and Egypt. Authorities from the three countries are already part of the network on a regional level and are now also set to conduct training measures. The Seahorse Mediterranean Network is the follow-up project to the Seahorse Atlantic Network, which the Spanish Guardia Civil established at the beginning of the millennium. The West African states Mauritania, Morocco, Senegal, Gambia, Guinea-Bissau and Cape Verde are also involved. These countries received 1.4 million euros from EU funds (80 percent) and from Spain (20 percent). The Seahorse Mediterranean Network was initially scheduled to commence operations back in 2015 as a call for tenders for technical equipment had been published in 2014. It was agreed at the time that Italy and Malta would establish regional situation centres to this end. In 2012, following the overthrow of Muammar Gaddafi, the rebel government in Libya signed a declaration according to which the country would lend its support to the Seahorse Mediterranean Network and establish military situation centres in Benghazi and Tripoli for this purpose. An agreement was reached with Libya to publish a call for tenders for “common infrastructure” in April 2014, including technical equipment and hardware and software. The renewed outbreak of civil war in Libya had, for the time being, put paid to these plans. This new attempt is evidently being spearheaded by Italy. In January, the Italian Government had concluded an agreement with Libya on migration control. Italy intends to support the Libyan Government of National Accord with drones and radar equipment, as well as with equipment and training. The coast guard will be supported with 10 patrol boats, whose delivery already started. In return, Libya is to undertake efforts to prevent irregular border crossings along its national border in the Sahara and to send migrants back to countries such as the Niger, Chad and the Sudan. Information from ship reporting systems, satellites, drones and surveillance aircraft can be exchanged via the Seahorse Mediterranean Network. Relevant data is derived from, among other sources, the member states, the military mission EUNAVFOR MED, the EU border agency Frontex, Europol, Interpol and other “partners in the region”. The US military is now also party to the common information space via AFRICOM in Stuttgart. The so-called fusion services of the surveillance system EUROSUR are also drawn upon to this end. EUROSUR consists of a number of subsystems for monitoring the Baltic Sea, Black Sea, Atlantic and Mediterranean. All information from national control centres in EUROSUR intersects at Frontex in Warsaw. The border agency decides whether or not to disclose the incoming information to other states or missions. In the central Mediterranean, Frontex coordinates Operation Triton, which seeks to register refugees arriving at the Italian coastline and to ensure that they submit their biometric data. The Libyan coastguard supports the navy and operates from a number of bases in six sectors (Zuwara, Tripoli, Misrata, Benghazi, Derna and Tobruk). According to the German Foreign Office, this comprises around 3500 people. However, the coastguard is, in a number of ports, controlled by militias that are not always loyal to the Government of National Accord. Moreover, the influence of the regime recognised by the European Union is limited. Of the approximately 25 crossing points on the country’s external borders, it controls only two. The coastguard nevertheless received support in the form of training for 78 members of the coastguard and navy on warships of the EU member states within the framework of the EU mission EUNAVFOR MED. Training at military facilities on land in Malta, Greece and Italy is envisaged as a next step. As things currently stand, “training package 3” is set to follow on the heels of “training package 2”. In order to “enforce law and order” in the Mediterranean, the Libyan navy must first establish a maritime situation centre where the data can be received and processed. Headed up by the Guardia Civil, the funds required for training the Libyan coastguard to run a maritime situation centre are to be increased by one million euros following a decision reached by the heads of state and government on 3 February 2017. The money is taken from the EU’s Development Cooperation Instrument. Representatives from the European External Action Service and the European Commission try to make deals with both the military and the police coast guard. Also Frontex has conducted training measures. While the number of missions conducted by the Libyan coastguard within the 12 mile zone and the 24 mile zone have, according to private rescue missions, recently been on the increase, Libyan authorities have yet to take action in the greater economic zone on the high seas. According to the law of the sea, the coastal states in the region are actually responsible for marine rescue operations. The responsibility for individual maritime search and rescue regions is governed by the International Convention on Maritime Search and Rescue of 1979 (“Search And Rescue Convention 79”). While Libya has acceded to this agreement, it is not fulfilling its obligations. What is more, no Libyan government has yet published any information on the boundaries of the Libyan maritime rescue zone to date. A responsible rescue coordination centre has also not been stipulated. This could change with the new initiative to establish the maritime situation centre. 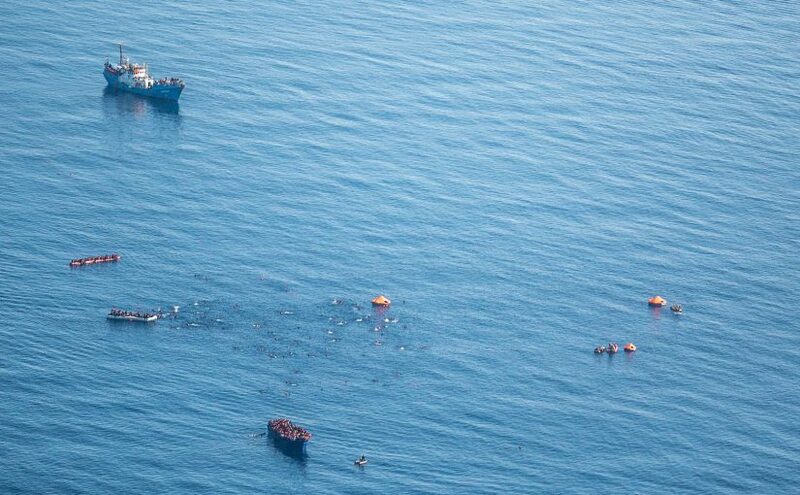 If the European Union were to manage to encourage the Government of National Accord to declare a maritime rescue zone, then the rescue missions off Libya could be coordinated by the authorities in the region. This would probably be a nightmare not only for refugees, but also for private rescue missions, which have come under fire from the coastguard on several occasions.